With more than 5m camping trips made each year, camping has never been more popular. Whether it's a few nights in UK favourites like Cornwall or the New Forest, wild camping in Scotland or the Lake District, or a summer holiday further afield on international sites like Ile de Re in France, it seems we can't get enough of camping. And it's the enduring popularity of camping that inspired us to create this group for people who love camping to club together and get a better deal on insurance. 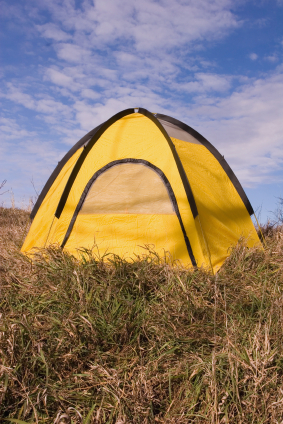 There are a couple of reasons why you might want to consider camping insurance. Firstly, in case there is an accident during a camping holiday that leads to your tent being damaged - such as a camping stove or kettle setting fire to the inner, or the campsite flooding. Secondly, in case the contents of the tent are stolen or destroyed - for example camping equipment and supplies such as camping chairs, tables, beds, gas, and lights. The costs of unfortunate events like these can be significant, and are typically not covered by travel insurance policies (including the Camping and Caravan Club insurance policy). With a top-of-the-range 4 man or 6 man tent suitable for a family camping holiday (such as the Outwell Wolf Lake 7 Tent) costing up to £1,500 to replace, and the total cost of camping gear including more expensive items like a camping fridge quickly adding up, campers can find themselves facing a big bill if they aren't covered by tent insurance. So, if 100 campers register interest by joining this group, we'll commit to opening a conversation with companies that offer camping insurance to find the best possible deal to insure your tent and camping gear.